Featured Review: Fire and Bone by Rachel A. Marks! “Gossip Girl meets Percy Jackson in the glitz and grit of L.A...." In Hollywood’s underworld of demigods, druids, and ancient bonds, one girl has a dangerous future. Sage is eighteen, down on her luck, and struggling to survive on the streets of Los Angeles. Everything changes the night she’s invited to a party — one that turns out to be a trap. Thrust into a magical world hidden within the City of Angels, Sage discovers that she’s the daughter of a Celtic goddess, with powers that are only in their infancy. Now that she is of age, she’s asked to pledge her service to one of the five deities, all keen on winning her favor by any means possible. She has to admit that she’s tempted — especially when this new life comes with spells, Hollywood glam, and a bodyguard with secrets of his own. Not to mention a prince whose proposal could boost her rank in the Otherworld. As loyalties shift, and as the two men vie for her attention, Sage tries to figure out who to trust in a realm she doesn’t understand. One thing's for sure: the trap she’s in has bigger claws than she thought. And it’s going to take a lot more than magic for this Celtic demigoddess to make it out alive. FIRE AND BONE by Rachel A. Marks is the beginning of a new young adult fantasy series. In many ways, it is similar to the Shadowhunter books by Cassandra Clare, but instead of New York City, FIRE AND BONE is set in Los Angeles. Marks replaces the grit of the streets with the glamour of Tinsel Town, and thus, breathes a new energy into this realm of fiction. The story opens with Sage, a homeless teenager, discovering she’s actually a powerful demigoddess, coveted by many. Reeling from this drastic change and struggling to control her abilities, she begins to have strange, vivid dreams. Her protector, Faelan, another demigod, helps her navigate what’s happening, but the truth of who she is ends up being much darker than anyone expected. This book is a complete and utter guilty pleasure. It’s lusty, romantic, and full of revenge. I enjoy the dual P.O.V. from Sage and Faelan, as they both have unique perspectives. Since they don’t necessarily communicate what they’re thinking with one another, it’s nice to have direct access to their minds. I also love how the author sets up the ultimate roadblock between Sage and Faelan. Faelan’s chastity vow makes a romantic relationship between them borderline dangerous, which immediately makes me as the reader more invested in them figuring it out. The writing overall is good enough. There are moments when the dialogue is unnatural, or even a bit sexist. Though it’s offsetting at first, remembering that the male characters are from hundreds of years ago and are products of their time help to see past that. 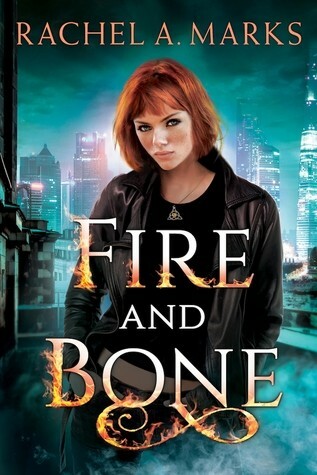 FIRE AND BONE also cashes in on a few tropes, particularly the one in which the main character is considered unattractive until she gains her powers. It reminds me of the TWILIGHT series when Bella becomes a vampire and is magically less awkward and more beautiful. I’m not a huge fan of this trope or how it was used in this book. Marks discusses Sage’s disappointing looks too often. While it may be a reality of Los Angeles culture, it’s quite tiresome. With that being said, FIRE AND BONE is pure entertainment. It’s the perfect book for anyone needing a fun escape from the real world. I continually looked forward to reading it and honestly, cannot wait for the next installment. The story ends on quite a cliffhanger and I am certain this is only the beginning for Sage. Oh the Thinks You Can Think About Dr. Seuss!